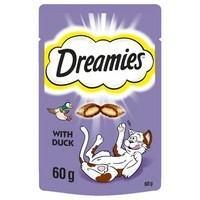 Dreamies Duck Flavoured Cat Treats are simply delicious and loved by cats! These mouth-watering treats are crunchy on the outside with a soft, duck flavoured centre. As they contain only 2 calories each, these treats are a great complementary snack to your cats well-balanced diet. Feed at any time as a snack or reward and use within 4 weeks of opening.